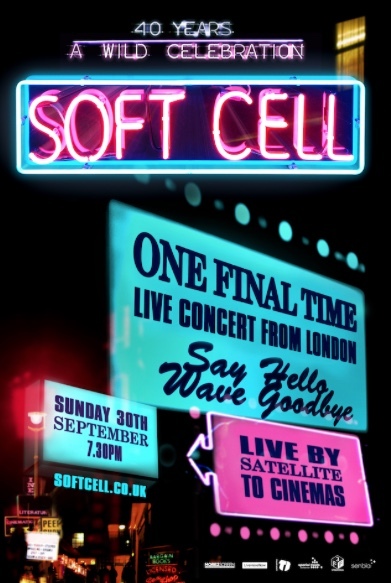 THE final – and SOLD OUT – show from Synth-pop pioneers, Soft Cell, will be broadcast LIVE from London to cinemas across the country on 30th September. Intervening years have seen both Marc Almond and Dave Ball’s talent recognised with successful solo careers in their own right, with Almond awarded an Ivor Novello Inspiration Award in 2013, as well as an OBE this year’s New Year’s Honours List. Ball went on to form The Grid, peaking with million-selling international hit ‘Swamp Thing’, as well as working as a producer and writer for the likes of Kylie Minogue and remixer for David Bowie, Pet Shop Boys, Erasure, Yello & The B-52’s.